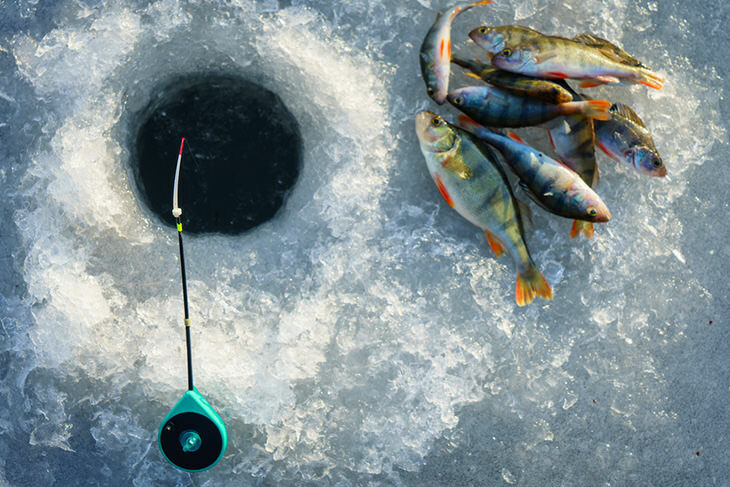 Have you ever tried ice fishing before? You are probably factoring in the cold, or the chance of falling through the ice and this could make you apprehensive about getting started. Well, ice fishing can prove to be fun once you plan and are fully prepared. Ice fishing reel and rod: it is advisable to use a spinning reel combined with a 24” ice fishing rod of light action. It depends on what you are comfortable with using. Having the proper tackle will help you be able to detect strikes. Appropriate clothing that will keep you warm. Remember to carry a good pair of gloves. Dress in layers, starting with a wicking. It is clothing made of quick-dry fabric. Follow it with a layer of insulation of possibly multiple layers and lastly, a waterproof shell that also acts as a windbreaker. Ice auger: used to cut through the ice. You can either use a hand model as they are cheap, but if you get a liking for the activity, it may be worthwhile to invest in a power auger. Assorted jigs and bait: stick to the basics, e.g. wax worms. The bait should be specified for a particular species. For example, if you are targeting sunfish or bluegills, they will bite on mousies, spikes, and even wax worms. Bucket with a lid: to sit on while fishing and also to act as storage for the fish you catch. You can carry a stool also, for sitting on while fishing. 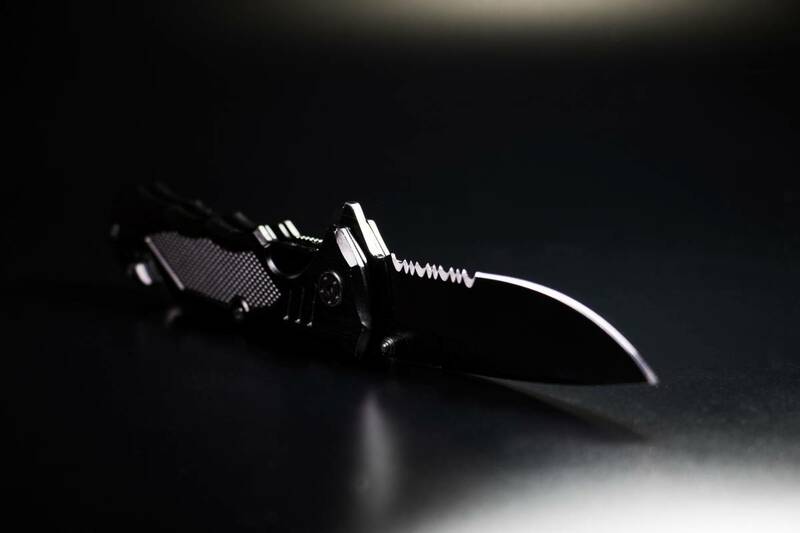 Ice picks: they come in handy if, by an unfortunate turn of events, you fall through the ice. You wear it around your neck, on a cord. It makes it easy to pull out of the hole. 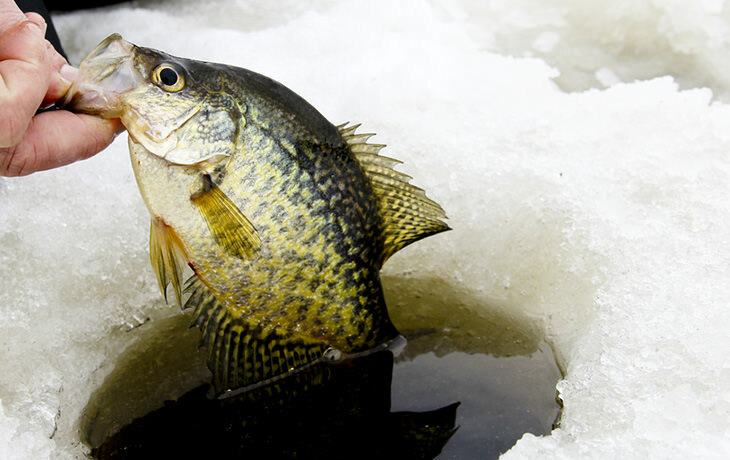 Panfish, crappie and other game fish: they are usually very active in the wee hours of the morning or late in the evening. For crappie, they are very active late in the day. Perch and Pike: they remain active during the day. They feed on sight, i.e. on what they see. Carrying bright lures for them would be wise. Bluegills, walleye: for these fish, they become more active after sunset, but you can still get a bite or two in the morning and during the day. You can only fish in ice that has a depth of at least 4 inches. Any activity on the ice can indicate that it is safe, i.e. if there are other anglers on it. If you are the first one there, find more on the conditions of the ice from the news, local bait shop, other anglers, etc. Keep a safe but respectable distance from other ice fishing enthusiasts with you. Find a particular spot, particularly when there is a depression in the ice, crank the auger and let it drill the ice. The ideal drill is one that has sharp blades, and you shouldn’t leave it laying on the ice, bare. Drop your line into the hole you have drilled. You can use minnows as bait. They work pretty well, in ice fishing. Be patient and watch the line or tip of your ice rod for any action. Make your bait move in erratic motion to cause a reaction from nearby fish. 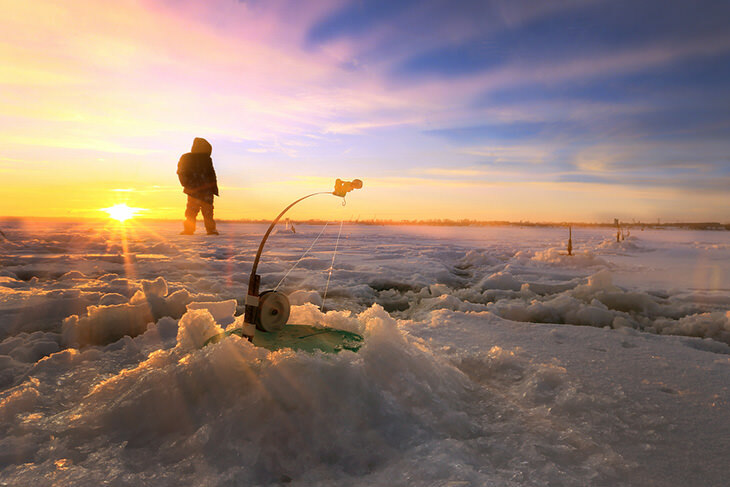 If you are an avid angler and would like to fish all year round, then you need to get started on ice fishing. It is an exciting experience once you have prepared well for the expedition. Put on protective clothing that will shield you from cold and the wind.